Most of the people use the internet to find products and services and that is why you see many mobile marketplaces advertising online offering local search of professionals and services near your place. It is easy to get your business listed on such business directories but most of the businesses are simply lost in the competition and never come visible to the end-user. Here, the businesses paying to these companies to get listed on the top win. So what is more important to you is to register your domain name to start your own business website which is relatively easy to start, inexpensive and more powerful medium to bring customers to your business because it shapes way for the netizens to land on your homepage from the search engine results page and all you need to get listed on search pages is by publishing useful posts about your products and services. Moreover, you may list your business and website in Google Business so that netizens would easily find the directions to your local store or office via Google Maps. Unlike other business directories, Google Business is much better because it works from the Google Search which is the leading internet search engine. Hence, the chances of getting listed on top generate from what the person is looking for and how your service is useful to him and not just mere paying-off to get listed on top. You are reading this because you are a netizen. This is your utmost universal value. Comparing to this your citizenship is a very local issue. Netizens are globally connected. Together being Sangkrit they are empowered as invincible everywhere. Sangkrit is the collaborative collective that lets you become self-led in the course by posting all statements here at Sangkrit.net addressed to you and you ought to cooperate to become like that. Thus you are homeschooled to become a freedom fighter for yourself so that you carry your freedom on the go through this smartphone stage of internet age. Contributing most to the world economy as a class, housewives are not paid for their works. Respecting them most Sangkrit invented house husbands to comply with them. Sangkrit’s program of cleaning, cooking, programming and blogging as constant way of life for everyone involved is exactly that. Ideally this is made around housewives’ way of life with necessary value addition into this through the internet age. Housewives of the world must make a revolution by spreading this everywhere and they shall be making money in the fast lane of internet growth. Housewives may very well start earning also simply by following Sangkrit. This suits to them most. They might most suitably start working as people’s personal outlet of internet growth engine by sending an email to system@sangkrit.net. The work is simplest and best for. They would be helping people around them in registering, transferring and hosting their domains at system.sangkrit.net in complete internet infrastructure with online support and global exposure. 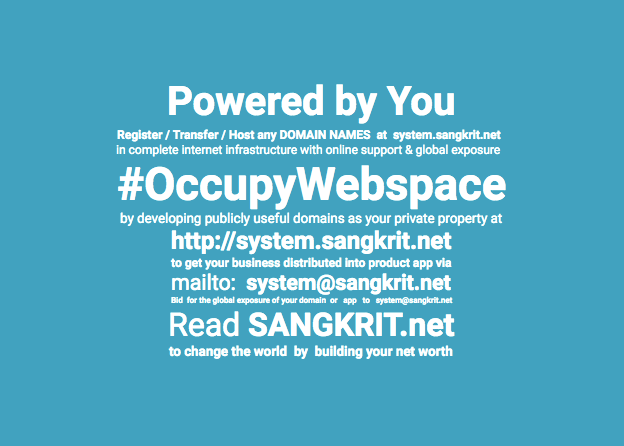 Dream the best as you may easily own that upon registering as domain at system.sangkrit.net and the rest could become your reality once you go ahead developing your domain by regularly investing your time and money into it. Upon internet if you do better than others, you are sure to monopolise your trade. That is how the internet monopolies always work better and that is why Sangkrit is very protective about internet monopolies. Individuals mostly fall short of their utmost chances and keep struggling within their gaps. Hastily they go for a lower profit booking in life for not to lose any upcoming opportunity because of their constant fear for survival. Once you stop fearing for that you overcome all that. Sangkrit is a public program ascertaining that.